Born at Bridges Creek, Virginia, in 1732, George Washington was the eldest of six children of his father's second wife. Further, he had four older half siblings from his father's first wife. When Washington was 11, his father died and he became the ward of his well-placed half brother Lawrence and his wife, Anne. By the time Washington was 20, Lawrence and Anne had died and he inherited their Mount Vernon estate. The young man became a well-respected farmer and gained a reputation for great integrity as he served in local community affairs. In 1753 he was made major in the southern militia and given the mission to warn off the French, who encroached on the British colonies from the Ohio Valley. Having succeeded against significant obstacles to deliver the warning, he was promoted to lieutenant colonel at the tender age of 22. The next year he marched with his regiment to engage the French, who were allied with the Indians. Despite some successes, he was overwhelmed and forced to surrender in the first major encounter of the French and Indian War. Washington later joined the staff of General Braddock, whose forces subsequently suffered catastrophic defeat at Fort Duquesne (later Fort Pitt, the site of present-day Pittsburgh). Yet Washington's great courage and calm demeanor were instrumental in saving the expedition from complete annihilation, and he led the remnant out of action. Almost miraculously he was one of the few unwounded officers. Returning to Virginia, he was appointed commander in chief of the Virginia defense forces and charged with defending the frontier against Indian and French incursions. At the conclusion of hostilities, Washington resigned his commission, returned to Mount Vernon and married Martha Custis in January 1759, gaining two stepchildren and substantial wealth. Over the next 15 years, he proved himself a successful entrepreneur and gentleman farmer, becoming one of the richest men of the colonies. He also devoted much of his time to local politics. His national career grew out of his high-minded and principled stance for freedom from British rule. He was chosen as a delegate of both the first and second Continental Congresses and was active in organizing troop volunteers and equipment for what he increasingly saw as the inevitable conflict to come. When the War of Independence eventually broke out in 1775, he was chosen as commander in chief, commissioned to pull together the various militias of the rebelling colonies into a cohesive force. Refusing any salary, he accepted the position but declared that he did not believe he was qualified, and that he accepted it only because the request had been unanimous. Following the defeat of the British at Boston in 1776, the Thirteen Colonies formed the fledgling United States and proclaimed their historic Declaration of Independence. But the war continued. Dogged by defeat, bitter weather, and chronic shortages of arms and ammunition, Washington rallied his languishing forces at Valley Forge at the end of 1777 and inspired them to persevere until their defeats eventually turned to victory. The genius of Washington's leadership lay in his great courage, his dogged determinaton in the face of sometimes impossible odds, and his utter refusal to countenance defeat. With the end of the War of Independence in 1783, Washington again resigned his commission and retired to Mount Vernon, where he worked tirelessly and selflessly to achieve a strong union of states united under one federal head. In 1786 the states were invited to attend a convention in Annapolis to amend the original Articles of Confederation and to build an effective central government, but there was insufficient support to establish a quorum. The failure of this convention led to the Philadelphia Convention the following year. As president of this convention, Washington was instrumental in the subsequent abandonment of the Articles of Confederation in favor of a constitution. During the course of the convention, however, the delegates became divided into two opposing parties. Washington was the only man commanding the respect of both factions, and so in 1789 he was unanimously elected as the first president of the United States. Somewhat reluctantly, he agreed to return once more to public life. Four years later he was persuaded that he, and he alone, could continue to unite the nation, and so he was elected for a second term. Frustrated that party politics had become firmly entrenched in the young nation's government, Washington refused to run for a third term and retreated yet again to his beloved Virginia estate. Truly here was a rare man, well equipped to inspire those under his orders—one who knew what it meant to be trounced, and how to make the best of it. Truly here was a rare man, well equipped to inspire those under his orders‹one who knew what it meant to be trounced, and how to make the best of it. As a leader, he had combined wisdom and fairness with tenacity and resolve as weapons in his armory. 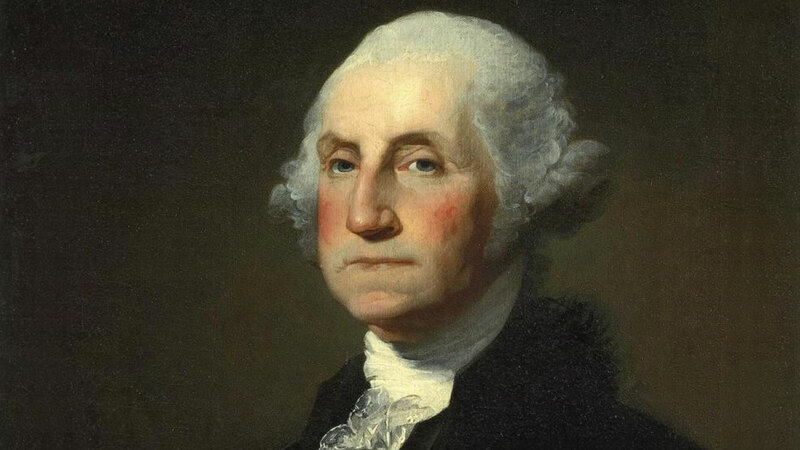 Washington, though childless himself, became known as "the father of his country.” He provided that crucial measure of leadership when the American colonies were bursting forth to independence. At his death in 1799, the British channel fleet fired a 20-gun salute in memory of a valiant former enemy.